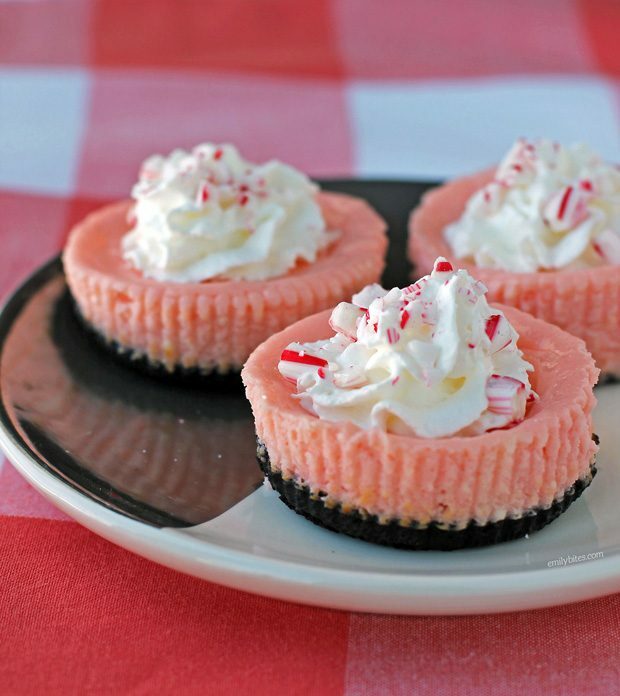 These Peppermint Cheesecake Cups are a perfect festive, lightened up dessert for the holidays. These creamy cheesecakes have a chocolate cookie crust and are lightened up with Greek yogurt, flavored with a bit of peppermint extract and finished with a sprinkling of crushed candy canes. You’re going to love how easy these are to make and how quickly they come together. Plus they’re just 116 calories or 5 Weight Watchers SmartPoints each! These Peppermint Cheesecake Cups are perfect for any Christmas party, work potluck or family gathering throughout the holiday season. Where do you find the Famous chocolate wafers? We do not have them here in Buffalo? Can you substitute with something else? We definitely have them in Buffalo! Pretty much any grocery store has them but you can definitely get them at Wegmans :). These look great! Once refrigerated, how long will they last? Can you freeze? Mine caved in the middle- is that normal?